El Paso, TX – The plight of migrants and refugees at the southern border is a topic of discussion and concern around the country. One group of people are rushing to the border to offer help and hope is religious Sisters. Sisters of all ages, from congregations across the country, are showing up at the “hot spots” of the border crisis – McAllen, El Paso, Brownsville, San Juan, San Ysidro – ready to cook meals, sort clothing, coordinate travel and do they can do to help these people in need. Five Dominican Sisters of Peace, Imelda Schmidt and Roserita Weber from Kansas, Mary Vuong from Texas, and Barbara Kane and Doris Regan from Ohio, recently returned from El Paso, TX, where they volunteered for two weeks at the Pastoral Center at the Diocese of El Paso under the direction of Annunciation House, a faith-based non-profit whose volunteers seek to live the Good News of the Gospel. The Sisters were warned about security concerns and danger, but followed the words of the apostle John: Greater love hath no man than this that a man lay down his life for his friend. 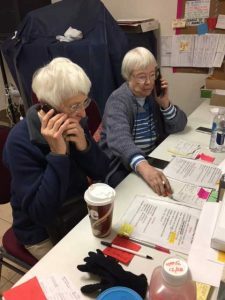 The Dominican Sisters of Peace who joined this ministry say that they did not see guns, drugs, or hardened criminals in the Hospitality Center where they volunteered in El Paso, nor were they treated with disrespect or entitlement. Instead, they met moms and dads who want exactly what each of us want – a safe place to raise their children, and an environment where families can work hard, contribute to their church and their community, and have the opportunity to thrive without the threat of violence. These families are not sneaking across a river or under a fence to disappear into the city and live as undocumented immigrants. On the contrary – the majority of them are seeking asylum – a completely legal request supported by both federal and international law. As soon as they cross the border, they surrender to authorities to begin the asylum process. According to a July 2018 article published by the CATO Institute, the United States has one of the lowest rates of asylee/refugee acceptance, ranking below Iraq, Iran, and Rwanda, so it could be a long road before they are accepted into the US – if they are at all. These families are all seeking security, peace and opportunity, but their journeys are all different. They came from Guatemala, Brazil, Honduras, El Salvador, Russia, and Cuba. Some walked for weeks. Some risked ocean voyages on pieced-together rafts. Some paid “coyotes” to arrange plane tickets and travel documents. All of them had undergone extraordinary hardship to get to the United States and attempt to start a new life. Sr. Roserita Weber, left, and Sr. Doris Regan, right, set up travel for refugees to join their sponsors. 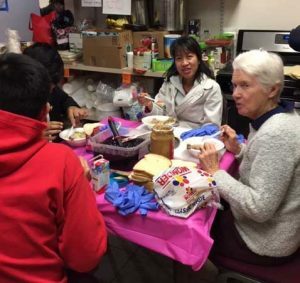 Sr. Mary Vuong, left, and Sr. Imelda Schmidt, right, prepare peanut butter and jelly sandwiches for refugees. Each person gets a 2-3 sandwiches per day of travel plus fruit, candy, water, and juice. If they are going to a cold place, they also get a small blanket. One disturbing fact that came to light during the Sisters’ time at the border is that while there are claims that family separation is no longer practiced, the reality at the border is a different story. While families from Russia or some other countries are permitted to move on together, families from Central America are separated. The father is turned away and only the mother and the children are allowed in the country. As a result, many families are separating voluntarily, with the father accompanying a child or two and the mother taking other children, in the hope that all will be allowed to seek asylum. The Dominican Sisters of Peace were blessed by their encounters with Christ at the Texas border. Several other Sisters and Associates left for El Paso on February 1, 2019.